Are you looking to really advance your hockey play? Consider yourself ready to make the step toward elite play? Do you desire a hockey stick to force you to tighten up on hitting accuracy? Perhaps develop a killer drag-flick? If so, the Grays GX7000 Probow could be the hockey stick for you! Pro layup, high carbon content, micro head with a tight but powerful sweet-spot and drag-flick groove at less than £200 are just some of the great features of the Grays GX7000 Probow that will help you go to the next level. Stepping up is a challenge for most players and the Grays GX7000 might just be the best hockey stick for making a move from good to great. Many advancing players believe they just need to move to full carbon material composition to get a stick to accompany their journey. There’s more to a truly pro hockey stick that tons of carbon. A challenge for any progressing player is to move to a micro head shape. The Grays GX7000 Probow includes Grays awesome Micro head. The head is slightly smaller than the maxi, compacting the sweet-spot slightly. This pushes you to be more accurate and rewards you with a tighter, more powerful hit. What the Grays GX7000 Probow isn’t, is a full carbon stick. At 80% carbon it’s just shy of what you might get in the top of the range. There are chunks of aramid throughout the stick to reinforce hitting areas though. If there is a lack of carbon in the Grays GX7000 when comparing to other sticks, it is made up for in other areas. Grays Probow shape for the shaft is just one of features designed to assist with drag-flicking. This shape is used by top players all over the world, perhaps most notably Ashley Jackson who is the best regarded drag-flicker in the elite game. A serious regulation testing 24.75mm curve is located just 200mm up from the ground giving awesome scoop in the bottom of the Probow version of the GX7000. The thing that makes the profile of the Probow great for drag-flicking however is the shape at the top end of the shaft. Grays Probow shaft stays relatively straight until the location of the curve, making it seem severe and slightly open the GX7000 Probow is great for getting under the ball when at a 45 degree angle to the ground. Additionally the micro head has a small concave area in the face designed to assist with the scoop but not effect control of the ball at other times. The combination of the shaft and the head shape in the GX7000 Probow also gives advancing players the tools they need to progress their controlled 3D skills. Little dinks over sticks are made easier by this great combination. Another area that will make you a great player is your ability to make those sweeping, hard reverse side passes and shots. Partly because of the Probow shape and with Grays aramid reinforcement hitting off the backhand with the elite players sweeping style is easier and more forgiving in the Grays GX7000. Lastly to mention in this review of the Grays GX7000 Probow is the vibration reduction system. As you advance your game and push yourself to become more accurate, no doubt you will catch the ball wrong a couple of times. This model of the GX7000 has Grays octagonal energy reduction handle. The shape of this handle alone spreads vibrations out around the octagonal shape. Under the grip is a special sleeve that also irons out energy to reduce vibrations being felt in your hand. 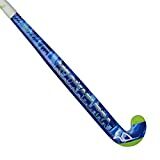 For the price, the Grays GX7000 gives you so many features of the top end sticks that are really going to make that step up in your field hockey game. The Grays GX7000 comes in a choice of 4 shaft molds, make sure you choose the right one. There is no real change from the 2014 model to the 2015 model, so if you can find one it might make this move even more value for money. Also, the fantastic Grays GX7000 is available in more shaft bow styles and includes more features than I’ve been able to list here. Make sure you check the overview review of Grays GX7000 hockey stick to get the full picture.